Engines and drivetrain are signature areas of excellence at Audi. The brand with the four rings has played a crucial pioneering role in a host of technical fields - from engine technologies to transmission technologies to quattro permanent all-wheel drive. With the exception of the 3.0 TDI, all Q5 versions have the completely newly developed quattro with ultra technology. It offers maximum efficiency and does not perceptibly differ from permanent systems in terms of traction and driving dynamics. The quattro permanent all-wheel drive system ensures optimal traction and handling under any road conditions. It comes standard with the 2.0 TFSI and the 2.0 TDI with an output of 140 kW (190 hp). It is optionally available for the 2.0 TDI with an output of 110 kW (150 hp). With quattro permanent all-wheel drive, Audi has extended its lead over a period of more than three decades. Now it’s time for the next big step: quattro in combination with ultra technology. The development goal of quattro with ultra technology is an all-wheel drive system optimized for efficiency with no discernible differences to permanent systems with respect to traction and driving dynamics. The system should set benchmarks in its class for fuel consumption and CO2 emissions, particularly under everyday conditions. With correspondingly equipped test vehicles, Audi developers used on average 0.3 liters/100 kilometers less fuel than with conventional all-wheel drive. The tests were conducted on a route throughout the Ingolstadt area and in normal traffic. In the powertrain, the lightning-quick shifts of the seven-speed S tronic dualclutch transmission, an optimized mechanical differential lock and a new electrohydraulically activated multi-plate clutch work together. The actively cooled allwheel drive system can distribute torque freely between the axles. The intelligent dynamic control system for the quattro drive is incorporated into the Audi drive select dynamic handling system that offers four basic modes. In each mode, the new high-performance sports car expresses a different character – from relaxed freeway cruiser to race car on the circuit track. In the top R8 V10 plus model, a performance leather steering wheel is standard equipment. In its performance mode, it offers three additional modes: dry, wet and snow. They make handling even more precise and sharper, tuned to the friction coefficient of the specific road surface. The new technology is also available on the R8 V10, including the steering wheel that is used to select the special modes. Like all Audi S models the Audi S1 and the S1 Sportback (7.0 / 7.1 liters of fuel per 100 kilometers [33.60 / 33.13 US mpg]; 162 / 166 grams of CO2 per kilometer [260.71 / 267.15 g/mile]) come with permanent all-wheel drive – another USP in this segment. Weight distribution constraints mean the hydraulic multi-plate clutch is mounted on the rear axle (axle load distribution: front 60 percent, rear 40 percent). 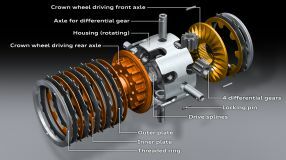 Depending on the driving situation, the electronically controlled clutch distributes the drive torque between the axles. If one of the axles starts to slip, the torque is instantly redirected to the other axle. The management of the multi-plate clutch is decidedly dynamic. It allows controlled drifts on a road surface with a low coefficient of friction in sport mode or with deactivated ESC. The first Audi quattro, which debuted in spring 1980, was a technical sensation. Its permanent all-wheel drive was lightweight, compact and fast-running, thus making it suitable for high speeds. The elegant quattro principle did not need the heavy, separate transfer case and weighty auxiliary shaft to the front axle that were the standard at the time. It was the first volume-built permanent all-wheel drive system suitable for fast and sporty cars. With the debut of the Audi 80 quattro in fall 1986, Audi introduced a new center differential – a component that was still strictly mechanical, but highly efficient. The name Torsen was a contraction of the words “torque” and “sensing.” The Torsen differential had already proved itself in the world of technology as a high-tech rear axle differential; Audi developed it further for use as a center differential. The Torsen differential is an excellent solution for a longitudinal engine and a drivetrain that runs in a straight line to the back. 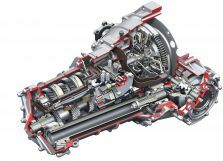 Audi chose an entirely different technology for the transverse-mounted engines in the compact models – an electronically controlled and hydraulically actuated multi-plate clutch. It first appeared in 1998 in the TT quattro and the A3 quattro. In 2005, Audi set off the next stage in the evolution of its classic quattro drive system in the second-generation RS 4. The new self-locking center differential, which is used in many models today, remained true to the principle of mechanical function, yet represented significant progress over the Torsen differential. The Audi R8 high-performance sports car occupies a special position in the Audi model range – and this extends to its packaging and its drive system. 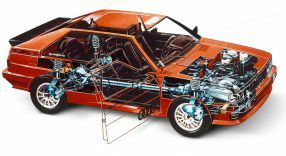 The mid-mounted engine is arranged longitudinally at the rear of the car in front of the rear axle, with the gearbox right behind it. It also includes an auxiliary drive for a prop shaft running past the engine on the side and up to the front axle. The self-locking center differential in the classic quattro drivetrain does an excellent job of distributing the power between the axles. To make driving even more dynamic, Audi introduced an additional component in the dynamic S4 Sedan in late 2008 that actively splits the torque between the wheels of the rear axle – the sport differential. Exactly 30 years after the debut of the first quattro, Audi introduced the latest evolutionary stage of its permanent all-wheel drive system for longitudinal front-mounted engines – quattro drive with crown gear differential and torque vectoring. The new 1.4 TDI follows the two-liter four-cylinder engine as the second engine in the Volkswagen Group's modular diesel engine platform (MDB). The three-cylinder unit is designed as a transverse engine and will enter volume production shortly. It has a displacement of 1,422 cc. The stroke of 95.5 millimeters (3.8 in) is taken from the 2.0 TDI; the bore has been reduced from 81.0 to 79.5 millimeters (3.2 to 3.1 in). Cylinder spacing is 88.0 millimeters (3.5 in). The 4.2 TDI has more torque than any other engine in the Audi lineup. The latest version in the Audi A8 delivers 850 Nm (626.9 lb-ft) between 2,000 and 2,750 revolutions per minute. Its peak output of 283 kW (385 hp) is available at just 3,750 rpm. The TDI engine gets its power from the boost pressure developed by the turbocharger, which is dependent on the energy of the exhaust. The electric biturbo breaks this dependency. Its supplemental electric compressor enables a rapid buildup of boost pressure and high torque even at low engine speeds. 25 years after the invention of the TDI, Audi is now taking the next big step and making the diesel engine even more emotional and sporty. In the past, the developers had to design emissions-control components for early response. As the efficiency of the TDI engines increases, exhaust gas temperatures are steadily falling. In the ECE cycle, temperatures measured downstream of the oxidation catalytic converter take 2.5 minutes to reach 150 degrees Celsius. Conversion does not take place below this threshold. The top version of the 3.0 TDI is a high-performance diesel engine, with which Audi is setting new standards for performance and efficiency. The twin-turbo design features two turbochargers connected in series that both provide thrust. In all internal combustion engines, undesirable nitrogen oxides are formed when combustion takes place at high temperatures with excess air. These gases can be largely avoided, however, through the use of exhaust gas recirculation (EGR). In every reciprocating engine, inertial forces and moments of inertia develop due to the oscillating motion of the pistons and connecting rods and the transmission behavior of the crankshaft drive. In some engine configurations, such as the V12 with 60 degrees of crankshaft rotation, these forces balance one another out and thus have no effect on normal driving. In an inline four-cylinder engine, however, free second-order forces of inertia detract from engine smoothness. For engine design engineers, the “rail” in a common rail system is a tubular high-pressure accumulator that maintains a supply of fuel at a constant high pressure. The rail is fed by a pump driven by the timing gear. The injectors are connected to the common rail by short steel pipes, and opened and closed by electrical impulses. When diesel oil is burned in an engine, soot particles are formed in the combustion chamber in certain operating areas. To eliminate these particles, Audi uses diesel particulate filters – closed-circuit systems with an efficiency of more than 95 percent. Audi common rail systems are components of fascinating precision that inject tiny amounts of fuel into the combustion chambers. The fuel is released from the nozzles at pressures of up to 2,000 bar (29,008 psi) and at several times the speed of sound. In some engines, Audi uses piezo injectors with eight-hole nozzles, with each hole only 0.12 millimeters (0.0047 in) in diameter. The piezo principle is an ideal complement for common rail fuel injection. Piezo crystals change their structure in a few thousandths of a second by expanding slightly when an electrical voltage is applied to them. Several hundred piezo wafers are stacked one above the other in the injector. As this stack expands, linear movement takes place and is transmitted directly to the injector needle, with no mechanical linkage in between. The TDI used in production passenger cars is one of Audi’s groundbreaking innovations. Development of the engine began in the late 1970s, headed by the then Member of the Board of Management for Technical Development Dr. Ferdinand Piëch. In 1989, the direct-injection turbocharged diesel engine with fully electronic control celebrated its premiere in the Audi 100. The 2.5-liter five-cylinder engine set new standards with a power output of 88 kW (120 hp), a peak torque of 265 Nm (195.45 lb-ft) and excellent fuel efficiency. Far superior to all earlier engine concepts, it marked the beginning of a veritable boom in the new technology. In many Audi engines, both TDI and gasoline models, switchable swirl and tumble flaps are housed in the intake area. These flaps allow the intake air to be perfectly modulated for specific loads and engine speeds. This creates a swirling motion that improves the air-fuel mixture and enhances power and torque, while at the same time lowering fuel consumption and decreasing emissions. The flaps are driven with either electric or pneumatic power, depending on their design. In all TDI engines from Audi, the turbochargers have variable turbine geometry on the exhaust side. Variable turbine geometry (VTG) technology builds up torque smoothly and without delay, even at low engine speeds. Since 2010, the 2.5 TFSI has been voted “International Engine of the Year” in its class for seven consecutive years. Now, Audi presents a new version of the successful power unit. The turbo engine which drives the new RS 3 Sedan* and the facelifted RS 3 Sportback* is the most powerful series-production five-cylinder engine on the world market. From 0 to 100 km/h (62.1 mph) in 3.6 seconds, 11.8 seconds for the sprint from 0 to 200 km/h (124.3 mph) and a top speed of 318 km/h (197.6 mph) sum up the dynamic performance of the new Audi R8 Spyder*. It sprints to 100 km/h (62.1 mph) two-tenths of a second faster than its predecessor, reaches the 200 km/h (124.3 mph) mark six-tenths of a second sooner and delivers 7 km/h (4.3 mph) more top speed. The five-cylinder achieves a good 17 percent more output from the unchanged displacement of 2,480 cc – 294 kW (400 hp) means a specific value of 161.3 hp per liter. The maximum torque of 480 Nm (354.0 lb-ft) is available from 1,700 rpm and remains constant up to 5,850 rpm. The new Audi TT RS Coupé thus accelerates from 0 to 100 km/h (62.1 mph) in 3.7 seconds; the Roadster takes 3.9 seconds. Standard top speed is a governed 250 km/h (155.3 mph). Audi will raise the top speed to 280 km/h (174.0 mph) upon request. The completely redesigned, turbocharged 3.0 TFSI engine for the Audi S5 Coupé offers powerful performance: high power, ample torque, spontaneous response and a sonorous sound. All of that paired with a new level of efficiency. The 2.0 TFSI with a displacement of 1,984 cc is available in the new the Audi A4 ultra and A4 Avant ultra. Its technical refinements are the exhaust manifold integrated into the cylinder head, the rotary-valve model for thermal management, the Audi valve-lift system (AVS) for the intake valves, the electric wastegate of the turbocharger and the dual fuel injection. In partial load, indirect injection in the inlet manifold supplements the FSI direct injection. ection. A clear sign of the popularity of the Audi A1* and A1 Sportback* is the over 500,000 cars sold since its market launch in 2010. Six engines – gasoline and diesel – are new or have been intensively further developed. For the first time, Audi is offering completely new three-cylinder engines, the 1.0 TFSI and the 1.4 TDI – they are efficient without neglecting driving fun. The multiple award-winning 2.5 TFSI produces 270 kW (367 hp) and 465 Nm (343.0 lb‑ft) of torque in the new RS 3 Sportback. The turbocharged engine accelerates the compact five‑door from 0 to 100 km/h in 4.3 seconds, and top speed can be increased to 280 km/h (174.0 mph) upon request. In the NEDC, it consumes just 8.1 liters of fuel per 100 kilometers (29.0 US mpg), with CO2 emissions of 189 grams per kilometer (304.2 g/mi). A central innovation in the 1.8 TFSI is the addition of indirect fuel injection. Indirect injection supplements FSI direct fuel injection in the part-load range. This lowers fuel consumption and reduces particulate emissions to within the limits of the future Euro 6 standard. FSI fuel injection is active when starting and at higher loads. The valve control system has been given greater operating freedom. The Audi valvelift system, which adjusts the lift of the valves as needed, is active on the exhaust side; the camshafts can also be adjusted. The Audi valvelift system, one of the major innovations of the brand with the four rings, regulates the lift of the valves in two stages depending on load and engine speed. The system thus increases torque while also reducing fuel consumption. In the A8 L, Audi’s top-of-the-line model, a twelve-cylinder powerplant provides outstanding propulsion. 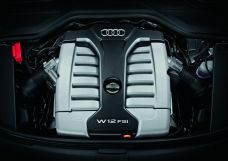 The “W12” abbreviation alludes to the unusual configuration of the 6.3-liter FSI engine: four rows consisting of three cylinders each. Two rows in each case face each other in an offset configuration at a 15-degree angle, collectively forming a single broad bank. Both cylinder banks thus form a 72-degree V configuration. The new 4.0 TFSI, a powerful V8 with twin turbochargers, is equipped with “cylinder on demand” technology. When operating at part load, four of its cylinders are deactivated. This reduces fuel consumption by an average of five percent. To complement this system there are two further technologies: Active noise control (ANC) and active engine mounts. They ensure that the car’s occupants do not hear or sense any disturbing noise or vibration even if the engine is operating in the four-cylinder mode. At Audi, FSI stands for gasoline direct injection, a technology in which fuel is injected directly into the combustion chambers, rather than into the intake manifold in the traditional manner. More favorable in terms of thermodynamics, this method improves the efficiency of the engine. FSI engines achieve higher performance and better dynamics than conventional engines, with better efficiency. Whether they have four, five, six, eight, ten or twelve cylinders, all gasoline engines from Audi today employ the FSI principle. Downsizing has a long legacy at Audi – the first turbocharged gasoline engine, a five-cylinder unit, was produced as early as the late 1970s. Today the brand uses a turbocharger on all its four- and five-cylinder engines, both TDI and TFSI units, to increase performance and torque. Certain large V-engines employ two chargers according to the bi-turbo principle. Alongside exhaust gas turbochargers, Audi also makes use of superchargers to boost its engines. A supercharger is used in the 3.0 TFSI. The high-efficiency mechanical charger is situated in the 90-degree V formed by the cylinder banks and is driven by the engine via a poly-V belt. The gas pathways downstream of the charger are very short, thus the torque develops quickly and easily. The full boost is available even at idle. As a turbocharger compresses the intake air, it heats up, reaching temperatures between 120 and 150 degrees Celsius (between 248 and 302 degrees Fahrenheit). Hot air has a lower density, however, and thus contains less oxygen for combustion. A charge-air cooler is therefore placed downstream of the turbocharger to cool the compressed air before it enters the combustion chamber. The engine ancillaries offer tremendous potential for efficiency. A new generation of oil pumps, which Audi employs in a number of models, are an important component. Smaller in terms of delivery rate, these volumetric-flow-controlled oil pumps operate only as required, and no longer need to circulate oil continuously. 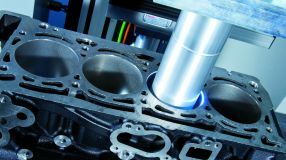 Combustion engines are subject to friction losses, in which a portion of the power disappears in the mechanical interaction of the engine components. The greatest losses occur in the crankshaft – at the pistons with their sealing rings, at the connecting rod bearings and at the main bearings of the crankshaft. The novel thermal management system, an innovation from Audi in many engines, lowers fuel consumption by up to 3 percent. 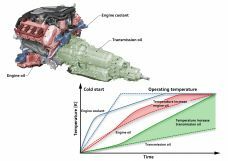 Rather than being circulated, the coolant remains still during the warm-up phase so that the engine oil quickly reaches its operating temperature of between 80 and 120 degrees Celsius (between 176 and 248 degrees Fahrenheit). This significantly shortens the phase of greater frictional resistance due to viscous oil in the crankshaft drive and valve gear. Found in much of the Audi model line-up – from the compact A1 to the R8 – manual transmissions are suited for pairing with front-wheel drive and quattro drive. While most manual transmissions operate with six gears, some use five gears. 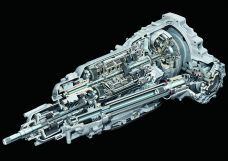 The continuously variable multitronic is an option for many Audi models with a longitudinal engine and front-wheel drive. Like all transmissions from Audi, it offers outstanding features such as low internal friction, a wide gear-ratio spread and high efficiency. The smooth multitronic nearly always allows the engine to operate in its optimal efficiency range. For dynamic drivers, it offers a sport program with closer gear ratios and a manual mode with eight stepped gears. The S tronic dual-clutch transmission is a successful technology. It combines the convenience of an automatic with the efficiency of a manual transmission, while adding its own dynamic touch. Throughout much of the model line-up, the S tronic is available in four different versions, with six or seven gears. The great strength of this classic torque-converter transmission lies in its remarkably smooth shift action and starting performance. Audi uses tiptronic in many models with longitudinally mounted engines, with either six or eight gears depending on the model line. The manual and automatic transmissions from Audi are highly efficient. Irrespective of design, they have all been optimized with regard to internal friction and are notable for their wide gear-ratio spread.